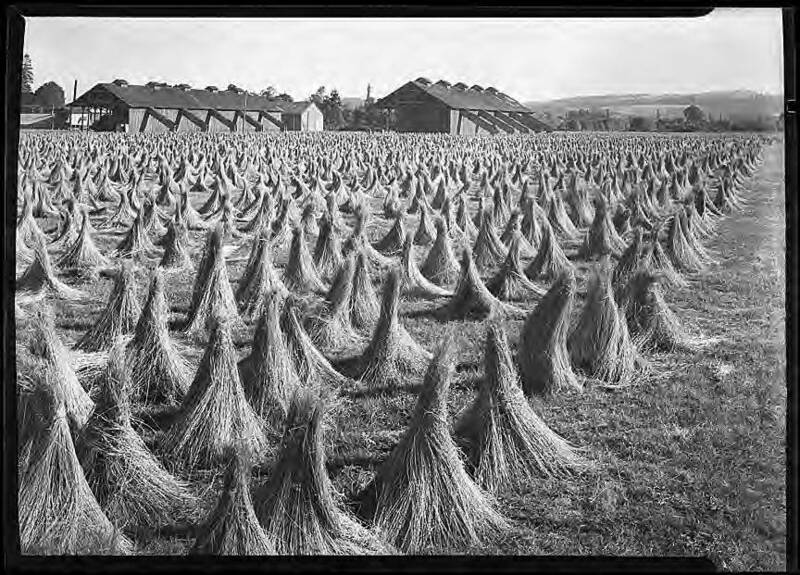 Black and white image of hand-harvested flax stacked in a field outside Cornelius, Oregon. These traditional stacks or 'little chapels' preserved the fibers at their longest and most supple, ideal for the manufacture of cloth. One of the oldest fibers known to mankind, flax produces both linen and linseed oil. A major crop in the Cornelius and North Plains area from the late 1800s, a large processing plant was built near Cornelius in the twentieth century. Cheaper cotton and synthetic fibers collapsed the flax market in the late 1950s. Currently, flax is on the upswing again as a crop, though today it is valued more for its seeds, which are rich in Omega-3 fatty acids and highly prized for both human consumption and animal feed.